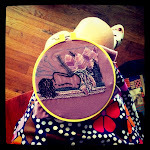 cocoaeyesthestitcher: What the heck is "stitch, stab & scrawl?" 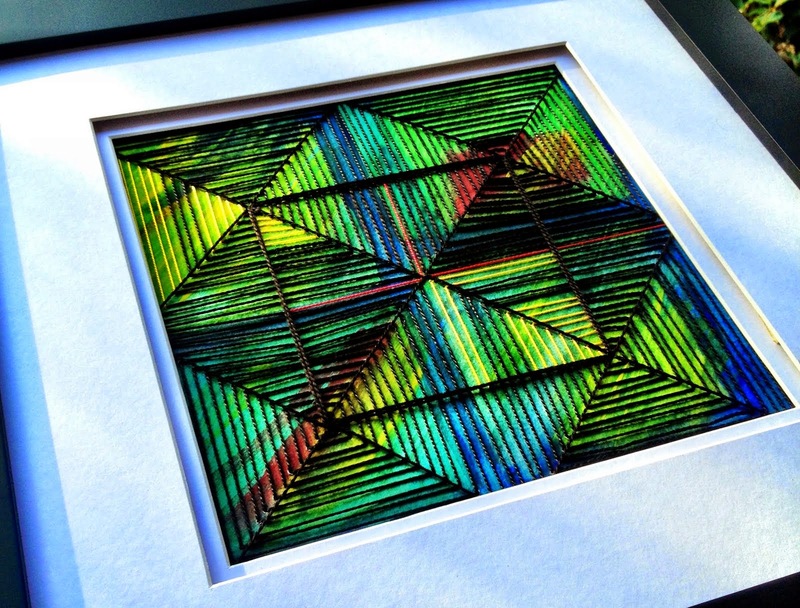 What the heck is "stitch, stab & scrawl?" Thought I'd create a simple blog to collect my adventures in toy making and other creative endeavors! 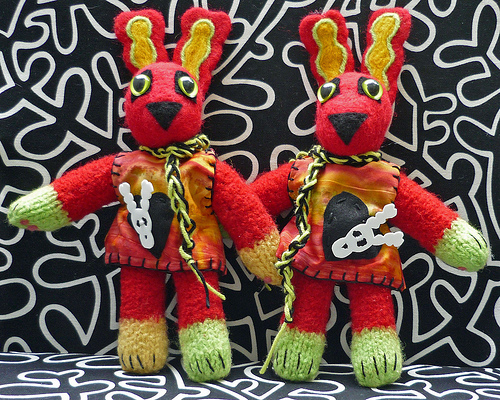 And to make my toys and other objects, I do a lot of stitching (sewing, embroidery, knitting), stabbing (needle felting) and scrawling (sketching designs, doodling, writing about the creatures I make). See, not as fearsome as it first sounded, huh? 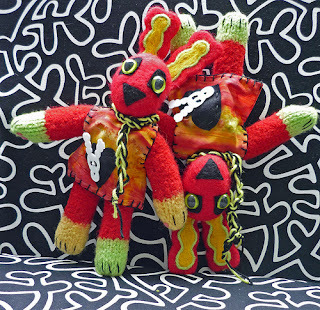 Here is an example of two creatures who I made with lots of stitching, stabbing and scrawling. 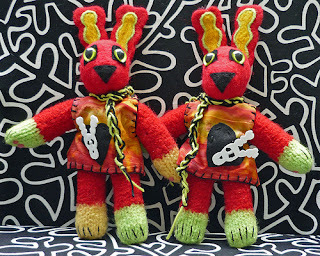 Meet Shabadoo & Shabadee, the demented bunnies of 2009. They are sisters living on separate coasts. Shabadoo lives with my friend Lisa in Portland and Shabadee lives with me in Durham. Huge fans of The Beastie Boys "Hey F*ck You!" from which they got their names. 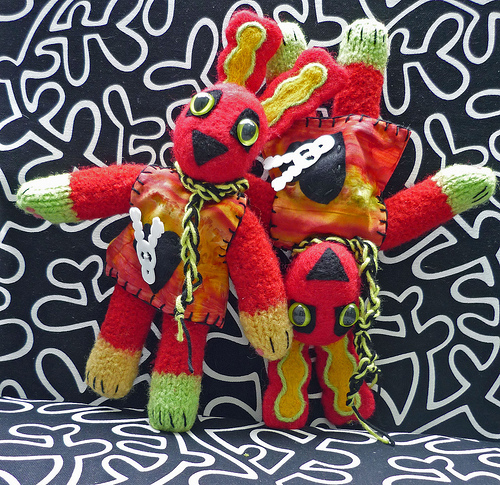 Shabadoo & Shabadee have knitted and felted bodies. Their heads are needle felted and ears are wet felted. They have various embroidery on their matching frocks and paws. And they sport art shrink paper images of their own skulls. They are tough girls. How do I get ears like Shabadoo & Shabadee? 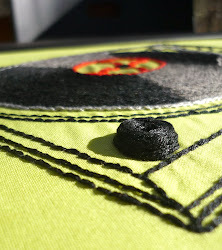 I'm afraid that it involves dozens and dozens of tiny stabs with my immensely sharp needle felting tool. Yikes! I feel so Lucky to have Shabadoo in my life. I see her everyday and think of you and your awesome work! Love her and you O!! Happy Halloween, freaks and ghouls!